송명섭, 김민영, 장귀영, 이윤정, Li Meishan, 오현아, 이준수, 정헌상,(2018).열처리에 따른 일반도라지와 으뜸도라지의 품질 특성.한국식품영양과학회지,47(4),462-467. 본 연구는 열처리에 따른 일반도라지와 으뜸도라지의 품질 특성 변화를 살펴보기 위하여 110°~150℃에서 2시간 열처리한 다음 성분 분석 및 항산화력을 측정하였다. 조회분, 조 단백질 함량, 조지방 함량은 으뜸도라지가 높았으며, 탄수화물은 일반도라지가 높았다. 열처리 온도가 증가함에 따라 pH는 감소하고 총 산도는 증가하였다. 환원당은 대조구에서 각각 8.00 ㎎/g 및 13.59 ㎎/g이었으며, 130°C에서는 각각 55.72 ㎎/g 및 51.04 ㎎/g으로 증가하였다가 그 이상의 온도에서는 감소하였다. 갈변도는 대조구에서 0.09 및 0.06이었으며, 150°C에서는 각각 0.53 및 0.50으로 증가하였다. 조사포닌 함량은 열처리 전에는 각각 16.43 ㎎/g 및 24.20 ㎎/g이었으며 열처리 온도가 증가함에 따라 증가하여 150°C에서는 각각 43.50 ㎎/g 및 67.70 ㎎/g으로 대조구 대비 3배 가까이 증가하였다. 총 폴리페놀 함량은 열처리 온도가 증가함에 따라 증가하여 150°C에서는 각각 7.14 ㎎ GA eq/g 및 7.27 ㎎ GA eq/g으로 나타났다. 항산화활성은 ABTS 라디칼 소거능, DPPH 라디칼 소거능 및 환원력 모두 열처리 온도가 증가함에 따라 증가하였다. This study investigated the quality characteristics of Normal and Etteum Doraji subjected to heat treatment at 110∼150℃ for 2 hours. Carbohydrate content was higher in Normal Doraji, and the contents of crude ash, crude lipids, and crude protein were higher in Etteum Doraji. The pH and total acidity were negatively correlated with increasing heat treatment. Reducing sugar content and browning index of Doraji increased after heat treatment. The crude saponin content of Normal and Etteum Doraji increased from 16.43 ㎎/g and 24.20 ㎎/g before heat treatment to 43.50 ㎎/g and 67.70 ㎎/g after heat treatment at 150℃. The highest total polyphenol content of 7.27 ㎎ gallic acid equivalent/g was observed in Etteum Doraji treated by heat treatment at 150℃. ABTS radical scavenging activity increased to 3.59 ㎎ ascorbic acid equivalent (AA eq)/g and 3.61 ㎎ AA eq/g after heat treatment at 150℃. DPPH radical scavenging activity increased to 3.02 ㎎ AA eq/g and 3.03 ㎎ AA eq/g after heat treatment at 150℃. Reducing power also increased to 0.47 and 0.53 at 150℃. Aida TM, Tajima K, Watanabe M, Saito Y, Kuroda K, Nonaka T, Hattori H, Smith Jr RL, Arai K. 2007. Reactions of D-fructose in water at temperatures up to 400°C and pressures up to 100 MPa. J Supercrit Fluids 42: 110-119. AOAC. 1990. Official methods of analysis. 15th ed. Association of Official Analytical Chemists Inc., Washington, DC, USA. p 342. Bae KM, Park SH, Jung KH, Kim MJ, Hong SH, Song YO, Lee H. 2010. Effects of roasting conditions on physicochemical properties and sensory properties of Liriopis tuber. 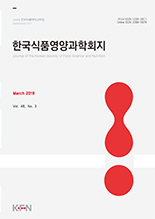 J Korean Soc Food Sci Nutr 39: 1503-1508. Choi Y, Lee SM, Chun J, Lee HB, Lee J. 2006. Influence of heat treatment on the antioxidant activities and polyphenolic compounds of Shiitake (Lentinus edodes) mushroom. Food Chem 99: 381-387. Chung JH, Shin PG, Ryu JC, Jang DS, Cho SH. 1997. Chemical compositions of Platycodon grandiflorus (jacquin) A. De Candolle. Agric Chem Biotechnol 40: 148-151.